We will start the day taking the old path that ran from Beranui to La Plana de Mont-ros, we will pass through La Plana de Mont-ros and begin an ascent to reach Castell-estaó. Here there is a viewing point overlooking La Vall Fosca. We will continue the journey over old paths towards Antist and later towards Estavill, from where we will descend towards the Torres monastery and the Devil’s Bridge. The Devil’s Bridge is an impressive feat of engineering, particularly on account of the dizzying height on which it is found. Legend has it that it is a diabolical work, executed in just one night. We will carry on towards La Bastida, a totally deserted village, to head for Erdo and Vilella. From Vilella we will set out for Xerallo, the cement ghost of the Pyrenees, but first we will drop by the Chapel of L’Ascensió. Here we will be able to contemplate the length and breadth of the Manyanet valley and we will cross Xerallo to make our way towards Mare de Déu de Castellgermà until we reach Les Esglésies. 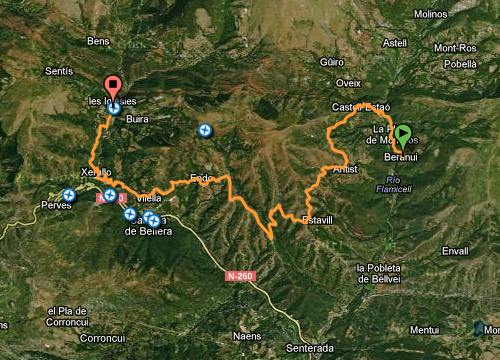 Points of passage: Beranui – la Plana de Mont-Rós – Castell-estaó- Antist- Estavill – el Pont del Diable – la Bastida – Erdo – Vilella – Xerallo- Mare de Déu de Castellgermà – les Esglésies. Difficulty: This stage does not present any technical difficulty.